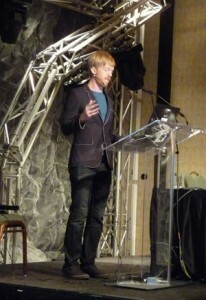 In November 2010 it took place another edition of the Montreal International Game Summit, and it was a great event. The first keynote was Ed Fries who gave a very inspiring, motivating talk on the beauty achieved through constrains. He started with a metaphor between the evolution of ancient base crafting and the game industry, he pointed out how the limitations in the crafting were setting the foundation of styles in the production of such beautiful pieces. The key point is that for creating beauty it is necessary to understand the limitations of the medium. In order to exemplify how comprehending limitations are critical for producing games, he showed his own work “Halo 2600”(click on the link to play it). It’s a version of Halo that he wrote for running on an Atari 2600. I’m an avid RTS player, and there is an upcoming game that promises to challenge how RTSs are played: Achron. The new aspect that this game brings is time travelling, yes, time travel in an RTS game. That’s twisted! Chris Hazard gave a talk on mathematical aspects on balancing games while keeping in mind that the game still have to be fun. Andrée-Anne Boisvert from Ubisoft Quebec on gave a talk on playtesting. She explained the importance of in-house playtesting, and quick turn-around to the development team. They employed the concept of persona to define a fictional end user, and rapid playtest with only 1 or 2 objectives; this approach helps to keep the focus on the most urgent matters, and refresh updates with the new data. Playtesting is done by the usability people themselves or others (developers, tester, end users), the number of ‘testers’ is kept low for fast data processing, and because for usability purposes 5 participants are enough for identifying usability problems (see Nielsen). The problems identified are hypothesis that are confirmed or rejected. With all the buzz around Kinect, Ryan Challinor from Harmonix presented the UI adventure they went through for the game “Dance Central”. It was really interesting to hear how UI designers working on Kinect products need to change the way they assumed people interact with devices. The gestural input changes a lot of the assumed rules. “Pushing air doesn’t feel good”. The UI work at Harmonix dealt with menu navigation, list of song, and selections. They also have the challenge of working with a new device that was still under development, thus glichty. Ryan showed different prototypes of the UI, pointing out to strength and weaknesses of each iteration. Todd Northcutt from Gamespy talked about leaderboards and (pretty much) how you feel about you position on the leaderboards 😉 He covered how ‘high scores’ were actually a local competition, for instance at the arcades or your family early consoles. At home you would know and recognize whose those three letters were, and that was an incentive to beat your brother, your cousin or the neighbour. With the pass of time and the millions of gamers, some leaderboards became absurd: you’re # 3,526,489! :-/ So, the point is how leaderboards are changing to be meaningful again, which is going back to its origins. For instance, in StarCraft your rank is segmented into small clusters with people or similar skills, you can make your way through the ladder. Other strategies involve to track multiple aspect of the player, for instance areas explored, guns own, skills levels, pets collected, etc, the idea is that then you can have multiple leaderboards on multiple aspects, and users have more chances of being first at something. It sounds a little bit cruel but it’s the true. We want to be number one, at something, at anything! So, it’s a way of giving recognition to players on diverse aspects of the game. Another leaderboard trend is to provide context, such as a leaderboard of only your friends, or of those in your same physical location (this is again going back to the origins), those who you know, which increases your interest on the leaderboard, and your desire to beat them! Lastly, Todd mentioned that leaderboards shouldn’t be kept forever, they need to be flushed out to keep the competition fresh. I presented the work done at Electronic Arts on user experience using psychophysiological techniques. Using sensors that measure facial muscle activity and galvanic skin response, it is possible to translate the data into emotions. Plus, by employing eye tracking, you can see where players look at on the screen. As you’ve read the summit had different interesting talks, there was also an expo floor. Montreal is an outstanding city. It’s amazing from multiple points of view: culturally alive, great public transport, friendly locals, excellent food, and a motivated game industry. 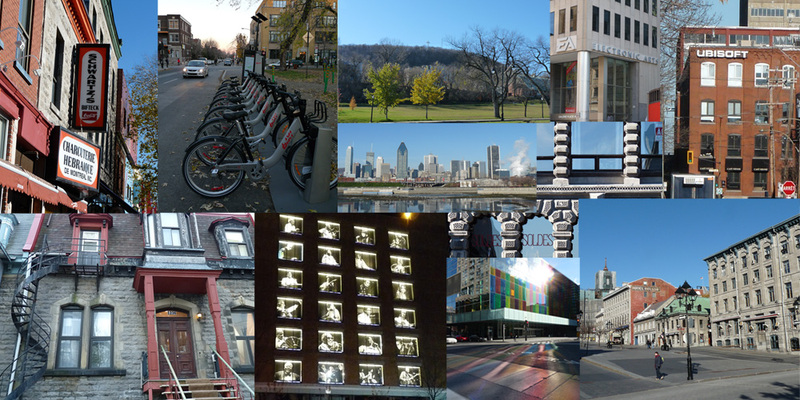 You can’t go wrong with Montreal!